Yvonne baked Loretta's birthday cake. 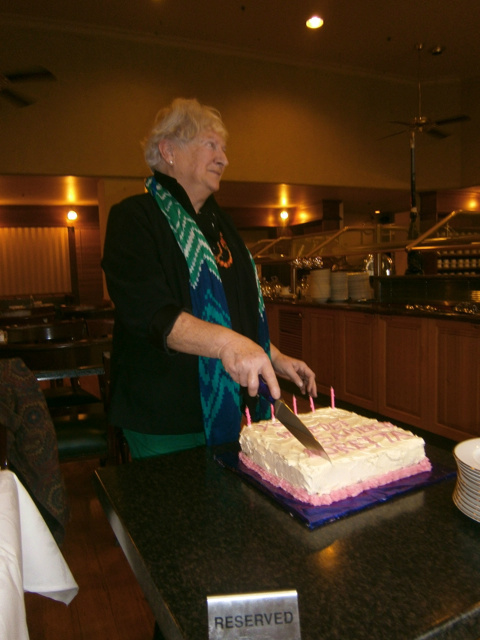 Loretta listened patiently to our lively rendition of Happy Birthday, blew out the candles then made the first cut into the cake. 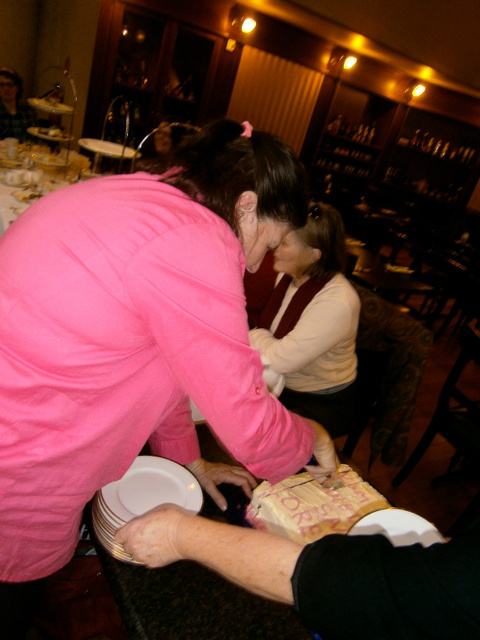 Yvonne took over, bringing her many skills to bear in cutting up even portions of the cake. 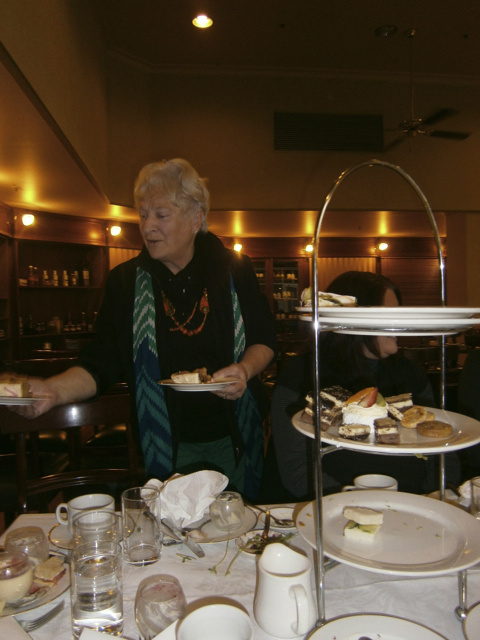 Loretta was happy to share and willingly handed plates to those sitting around the table. Meanwhile, Wendy and Wendy, Jane, Christina and Ros were happy to make small talk. 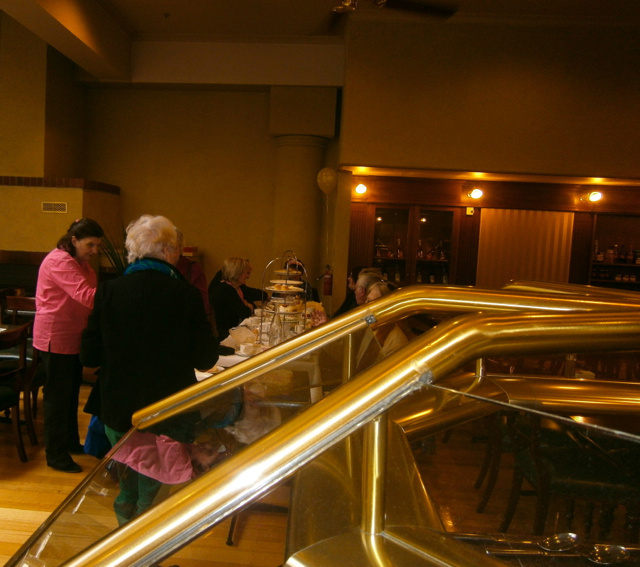 Once again we were delighted to be able to meet up at the Hotel Grand Chancellor for our 4th Annual High Tea. The reason for the instigation of this event may well over time fade into the misty realms of the past, but for now we can come up with all sorts of excuses to celebrate. This year was no exception with a dual purpose for the celebration. Firstly, Loretta reached a significant milestone birthday which we couldn't ignore, so she had to fortunately or unfortunately remain calm and collected, poised while we sang the traditional Happy Birthday to her. 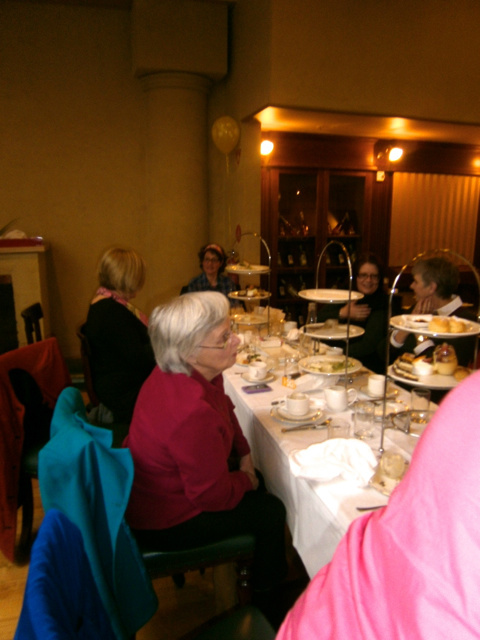 Then there was the celebration and congratulations for Yvonne, Ros, and Joy (who was unable to attend), who'd all attained a Master of Creative Writing degree via UTAS (University of Tasmania), and Erin, who also sadly couldn't be with us on the day, for her Diploma in Art. We now look forward to hearing the novels, which were written as part of the degree course, have since been published.